Our Emoji set is now compliant to Unicode 11.0. With this Emoji upgrade, we are now supporting 891 new Emoji icons that we weren't supporting before, as we were compliant to Unicode 8.0. This Emoji artwork is provided by JoyPixels. We hope you enjoy their new look and that you enjoy the many new Emoji supported. You can now define what is your Intent of using Similar Worlds. 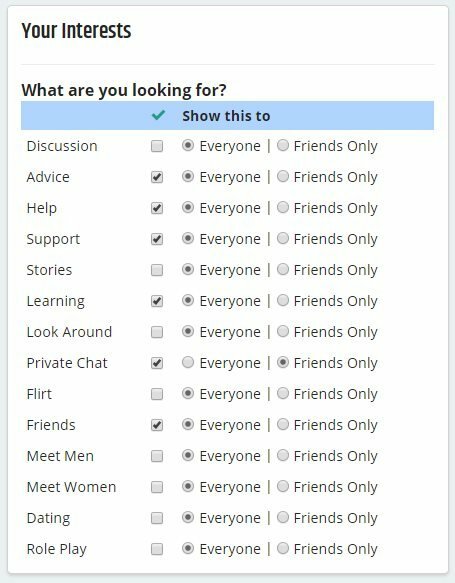 Whether you want to be on Similar Worlds for Advice, Making Friends, writing/reading Stories... that's up to you, and you can make it clear as soon as someone visits your profile. You can hide specific intents from Everyone, if you don't feel comfortable to share some of them with everyone. This is a completely optional feature. We added a few more optional fields that you can add to your profile. We also added 🛡️ Privacy Options to existing old fields such as your Country. - Increased Photo max Upload size (we understand how good the quality of the photos is these days!). - When Taking Photo with Camera, now you can choose between front and back camera on phone (unfortunately, some phones such as iPhone may not support this yet). - Allow to delete Gifts before unwrapping them. We also improved the text box where you write your evidence, so that it expands as you write, making it easier for you to type. Please remember that even though you can report contents with the above to us, you should also have a look at the pages above so you know how you can proceed in the different scenarios. While we try to do our best, due to the number of reports we receive, [u]you can help us greatly by documenting the case with all the information you have and contact the authorities[/u]. - If the user you are responding to in a message has an active profile warning, we will show that warning to you. This is helpful especially if you're talking with someone new and the message tells you that this user has a history of harrassing/bullying other people. - For new users talking to you, in some cases we may show you some small auto-generated alerts telling you the risks of providing personal private information/photos to other users. We may also detect Suicide thoughts coming from the other user, that you may want to provide support to. - We brought Full Pagination to the Profiles! May not be perfect in all cases, depending on whether you are filtering adult posts, but should be useful in most cases. We got loads of nice feedback from many users when this was implemented! Thank you everyone. - Expanded body of several pages on Similar Worlds, when there is no sidebar menu to show (no difference on mobiles). - Get full About Me text without leaving the Profile page. - Photo Count is now displayed in the profile picture corner. - Confirmation pop-up when setting an image as profile picture. - Show all users in Friends/Circle/Followers, even if cancelled, except if you're not the owner of that list. - A number of other minor design/layout fixes and improvements. We upgraded our Password encryption to a more secure algorithm (with random salt added per user). Note that we don't know our users' passwords (since they are encrypted), so we only migrate users to the new algorithm when they log in or change their password (this is the normal standard method of doing this). We also increased the hashes in the private big version of photos of the users, to increase protection. The suicide helpline pages by country are incredible. Thank you for those. I would like a "last online" note on my Blocked and Muted lists. The date I blocked them is semi-helpful, but if I could see they were no longer active, I could un-block them perhaps. Save my blocks for actively annoying people! Lol. Right now, I may un-block and cross my fingers they don't show up, because I won't remember to re-block them in 24 hours. Thanks!! !